Phase diagrams are "maps" materials scientists often use to design new materials. They define what compounds and solutions are formed and their respective compositions and amounts when several elements are mixed together under a certain temperature and pressure. This monograph is the most comprehensive reference book on experimental methods for phase diagram determination. It covers a wide range of methods that have been used to determine phase diagrams of metals, ceramics, slags, and hydrides. This book is suitable for researchers in industrial and national laboratories, universities and graduate students majoring in materials science and engineering. It is also suitable for phase diagram researchers, solid state physicists and inorganic chemists. Chapter 1. Introduction to Phase Diagrams (J.F. Smith). Chapter 2. The Role of Phase Transformation Kinetics in Phase Diagram Determination and Assessment (J-C. Zhao). Chapter 3. Correct and Incorrect Phase Diagram Features (H. Okamoto, T.B. Massalski). Chapter 4. Determination of Phase Diagrams Using Equilibrated Alloys (Y. Zhong Zhan et al.). Chapter 5. DTA and Heat-Flux DSC Measurements of Alloy Melting and Freezing (W.J. Boettinger et al.). Chapter 6. Application of Diffusion Couples in Phase Diagram Determination (A.A. Kodentsov et al.). Chapter 7. Phase Diagram Determination Using Diffusion Multiples (J-C. Zhao). Chapter 8. Application of Computational Thermodynamics to Rapidly Determine Multicomponent Phase Diagrams (Y. Austin Chang, Y. Yang). Chapter 9. Determination of Phase Diagrams with Reactive or Volatile Elements (C. Guminski). Chapter 10. Phase Diagram Determination of Ceramic Systems (D. Edwards). Chapter 11. Determination of Phase Diagrams Involving Order-Disorder Transitions (R. Kainuma et al.). Chapter 12. Determination of Phase Diagrams Involving Magnetic Transitions (I. Takeuchi, S.E. Lofland). Chapter 13. Determination of Pressure-Dependent Phase Diagrams (S.K. Saxena, Y. Wang). Chapter 14. 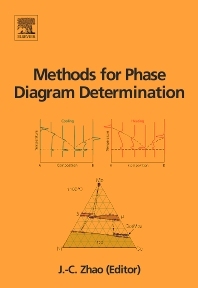 The Determination of Phase Diagrams for Slag Systems (D. Gaskell). Chapter 15. Determination of Phase Diagrams for Hydrogen-Containing Systems (T.B. Flanagan, W. Luo). Chapter 16. Miscellaneous Topics on Phase Diagrams (J-C. Zhao and J.H. Westbrook). Prof. J.-C. Zhao joined the Department of Materials Science and Engineering at The Ohio State University (OSU) in January 2008 after 12 years (1995 to 2007) as a materials scientist and project/team leader at GE Global Research in Niskayuna/Schenectady, NY. He obtained his PhD degree in materials science and engineering from Lehigh University in 1995. His research focuses are on high-throughput materials science methodologies, phase diagrams, computational thermodynamics, diffusion, design of advanced alloys and coatings, and hydrogen storage materials. In addition to many materials innovations, he developed a diffusion-multiple approach and co-developed several associated materials property microscopy tools for accelerated materials discovery and development. Zhao has received several honors including the Geisler Award from ASM International, the Hull Award from GE Global Research and the Lumley Interdisciplinary Research Award from OSU, and was elected a Fellow of ASM International in 2003. He has published about 100 papers and edited/co-edited three books and two theme issues of MRS Bulletin.